I wasn’t in the mood for explosions or wearing my rock club earplugs to the movies, so the weekend Iron Man 3 opened, I went to my local movie-house and saw François Ozon’s Dans La Maison (or In the House). Ozon wrote the screenplay based on Juan Mayorga’s play, with which I am unfamiliar, but the action probably played well onstage. It’s a seemingly simple story simply told and I was riveted. Fabrice Luchini plays Germain, who teaches literature and writing at the French version of high school; his wife Jeanne (Kristin Scott Thomas) manages a small art gallery for an owner who just died. Germain’s newest and most intriguing student is Claude (an intense Ernst Umhauer), whose writing skills grab Germain’s interest. Claude’s writing assignments are based on his visits to a schoolmate’s home as he tutors the other boy (Rapha, realistically played by Bastien Ughetto) in math. Claude has been watching Rapha’s house from a park bench for some time, hungry for what he calls “the perfect family.” He involves himself with Rapha and his father (also Rapha, played by Denis Ménochet) and mother Esther (the wonderful Emmanuelle Seigner), insinuating himself into the perfect family he craves. Claude writes his adventures, Germain advises him on empathizing with and developing his characters. Germain also shares Claude’s stories with wife Jeanne, involving her in this questionable journey. As we willingly follow along, the possibilities for nasty ramifications coming of Germain’s adventures with Claude amplify — not just in terms of how others may interpret Claude’s stories, but what Germain might do to ensure Claude continues writing the stories to which Germain is addicted. Or is he addicted to Claude, his wife wonders. All the while, of course, we see Claude’s infatuation with Esther growing — Mother? Lover? We watch Claude revise his stories to please Germain, then watch as the experiences at Rapha’s house change. Which scenes that Claude wrote really happened? The originals or the revisions? How much of what Claude shows Germain is true, how much of what Ozon shows us is true? How does one tell the difference between fiction and non-fiction? What is truth in fiction, what is voyeurism? Mind you, one does not wonder such things during the film. During the film we are experiencing what Germain experiences, questioning when he does, taking his side when others are unjust to him. And marveling at the light touch of the delicious Monsieur Luchini, at the clear and natural behavior of Ms. Scott Thomas and Mlle. Seigner, then gleefully watching this young man, Ernst Umhauer, knowing we’re witnessing the beginning of a fascinating film career. By the end of the film, Germain and Claude sit on a park bench looking at the windows of an apartment bloc. Life is taking place through each window, and stories can be assumed or made up about all of them. Dans la Maison is a fascinating piece of work, each character fully realized by the actor. Monsieur Ozon captures the imagination and the conscience of his audience, and makes us question our own stories. Last night, I saw David Edgar’s adaptation of Ibsen’s The Master Builder at BAM, as directed by Andrei Belgrader. Not fascinating. John Turturro was a little bit of Pacino and a little bit of George C. Scott, but not particularly Halvard Solness, the egomaniacal Master Builder. Santo Loquasto’s set was practical but disappointing, while the incidental music (by Christian Frederickson and Ryan Rumery, also credited with sound design) was lovely. Wrenn Schmidt was alternately engaging and annoying as Hilde Wangel, the “other woman” who isn’t quite real. The highlight of the evening, however, was watching, hearing, and delighting in Katherine Borowitz as Solness’ wife Aline. Each time she entered the stage, the play picked up. She was a human being, with ticks and character and a history lending her a fragility that drew us to her. The rest of the cast paled beside her, but the most amateurish performance was by Ken Cheeseman as the local doctor. 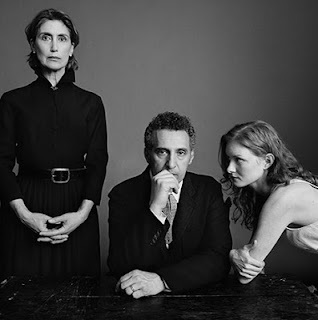 Katherine Borowitz, John Turturro, and Wrenn Schmidt. Photo (c) 2013 Graeme Mitchell. So ends our spring season subscription to BAM. Some good, some not, yet always worthwhile. ~ Molly Matera, signing off to get some sleep before the EST One Act Marathon starts.